Well I am done with one Business Casual sock. This pattern has been a challenge. For me the most complex part of the project has been keeping track of the pattern. Since there are cabling stitches on every row your mind has to be on alert at all times. My brain was feeling tierd so I didn’t even bind the sock off completely 😕. Currently, I am suffering from SSS (Second Sock Syndrome) so this project is in hibernation. I did manage to start another project. I had some darker rainbow yarn left over from when I went to New Mexico. I wanted to make a scarf, but there was not enough yarn. *sigh* What is a girl to do? Well make a headband of course! 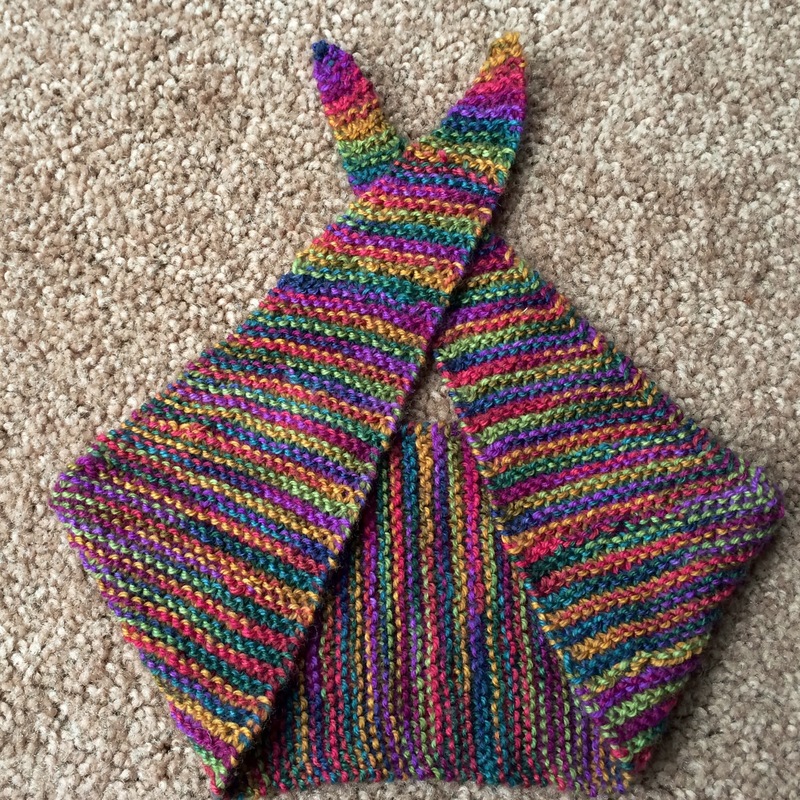 My inspiration came from Purl Bee’s Color Tipped Scarf. I love their simple and practical designs that showcase the beauty of yarn. The designers continue to be some of my favorites. I followed the pattern until I had increased to about 25 sts. From that point, I knitted for several inches with just garter stitch. I then decreased down to 3 sts on the other side. The headband came out great. 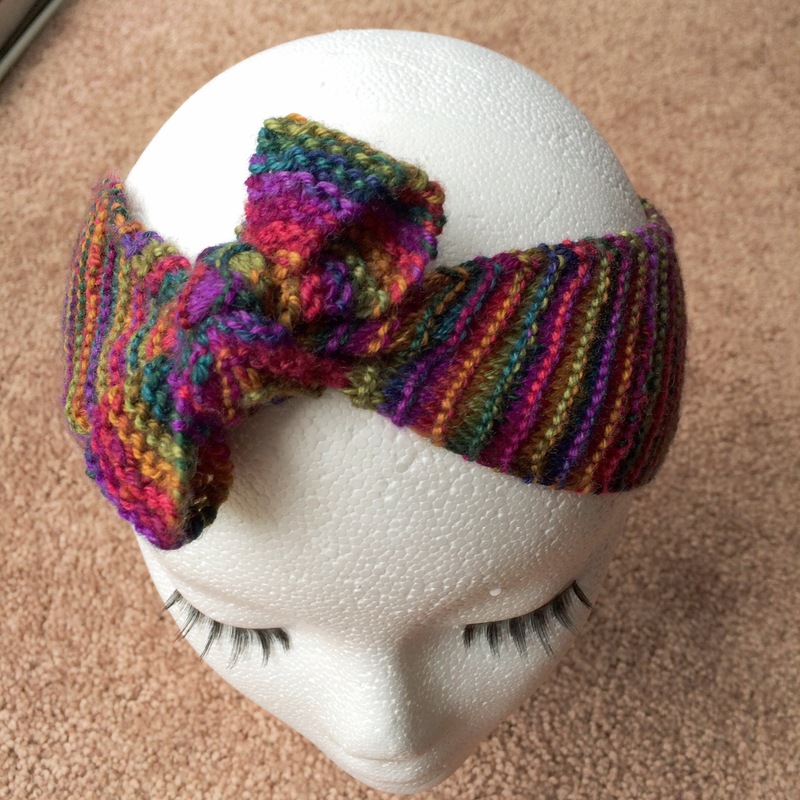 I love wrap headbands as they are perfect for covering up not so great looking hair. This headband also is thick enough to wear over the ears so it can double as a fall/winter accessory. I have a week and a half left till it is time to report to work. As much as I love having the time off, I get a little stir crazy after about 3 days. I decided that a challenging, yet quick(er) knitting project was in order. Immediately socks came to mind. 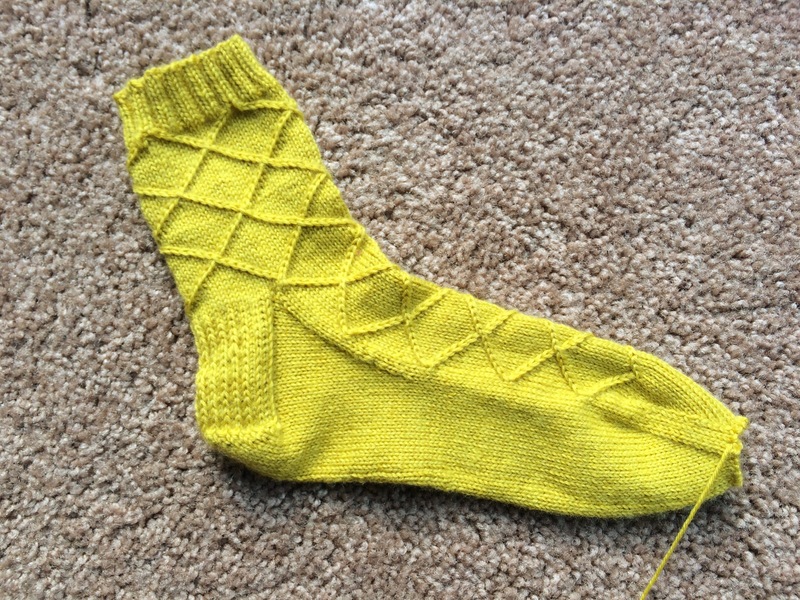 I chose the pattern Warm up Socks from the book The Joy of Sox by Linda Kopp. The lacy pattern as well as dainty cable really caught my eye. I slightly modified the pattern as my foot is really small (US size 5). I decreased the number of circumference stitches as well as the length of the sock. The trickiest part so far has been the heel shaping. It uses short rows, which are great, but the directions are a little wordy. I definitely had to read them over a couple of times to make sure I was on the right track. The yarn was purchased on my trip to New York City at Purl Bee. I follow their Instagram feed and love the free patterns on their website. Therefore, visiting the shop was a real treat. The shop itself is quite cute and the staff was very friendly. I controlled myself greatly as there was a beautiful selection of yarn. My final selection was a skein of Anzula Squishy in Chiva. It is a mix of Superwash Merino (80%), Cashmere (10%), and Nylon (10%). This yarn is great! Very soft, beautiful color depth, and is quite durable ( tested several times after many pattern errors 😦 ).